I've been tracking down various bits and pieces for the Lark - filters, plugs and such - and I'm finding that while they are still available from major manufacturers, many stores don't stock them. So it's good to know the part numbers from all makers. 1963 Studebaker V-8s are "full-flow" engines; that is, the oil circulates completely through the lube galleries before passing through the oil filter. Older Stude engines were "partial-flow" designs, where the oil wasn't forced all the way through all the time, and thus some of the engine's oil might possibly never see the filter. You can differentiate the two by the location of the filter itself: partial-flow engines have the filter positioned on top of the intake manifold; full-flows put the filter on the passengers' side of the block near the oil pan. 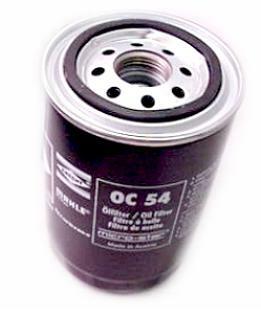 Anyway, here are the part numbers for oil filters for the major filter suppliers. Note that these part numbers were obtained by looking up specifics for a 1963 Stude 259; other years and displacements may be different. I was really hoping that K&N might make a filter, but I guess the Studebaker isn't commonplace enough for them. Too bad! A short update, since things have been quiet here lately. The engine is at StudeKen's getting rebuilt at the moment; I am dropping the transmission off at Tri-City Transmission in Vista this afternoon for a bench inspection and possible rebuild; the radiator is at S&S Radiator King in Oceanside for a re-core and tank test, and I finally acquired all the parts needed to get the e-brake working again (the equalizer came in the mail yesterday). I received the carb rebuild kit from The Carburetor Shop about a week ago. And all of my manifolds are out for sandblasting at a friend of Roger Knight's. More updates when they happen!